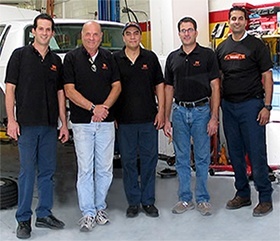 About Us | Westside Transmission & Automotive Inc.
From left to right, meet: Jack Debasc, David Debasc, Sandoval Bernardo, Joe Debasc and Ozeri Frez. Westside Transmission and Automotive is your premier choice for stellar auto repair services in Los Angeles. Our auto technicians are highly trained and genuinely have a passion for auto repair. We go above and beyond to ensure that your experience with us is transparent, comfortable, and efficient. Other auto repair shops just can’t match our auto repair expertise and commitment to exemplary customer service. But how did our story begin? Keep reading to learn more about us. The doors of Westside Transmission and Automotive officially opened in 2000, but for Jack DeBasc, the owner of our auto repair shop, the story began before he even reached 18. Because his father owned two auto repair shops, Jack was always surrounded by the automotive industry. He learned just how much he enjoyed the challenge and complexity of auto and transmission repair, including advanced electronics. This love for learning pushes him to stay abreast of the ever-changing auto industry by using only the latest and greatest tools and technology, along with never backing away from even the trickiest of problems. Not only do we offer excellent auto repair, but we aim to provide you with a stress-free and positive experience. There’s no need for you to experience stress when you visit our state-of-the-art facilities. At Westside Transmission and Automotive, we go that extra mile to put you at ease. If you need us to send you pictures of parts of your car that we should be replaced, you got it! If you need towing services, free shuttle service, or discounted rental cars, we’ll take care of that too! We communicate openly and genuinely have your best interest at heart. We welcome you to contact us at Westside Transmission and Automotive if you need auto repair. We’re centrally located at 2050 Cotner Avenue in Los Angeles, CA 90025. The team of ASE-Certified auto technicians at Westside Transmission and Automotive are ready, willing, and able to offer quality repairs. We look forward to your visit and providing you exceptional services!